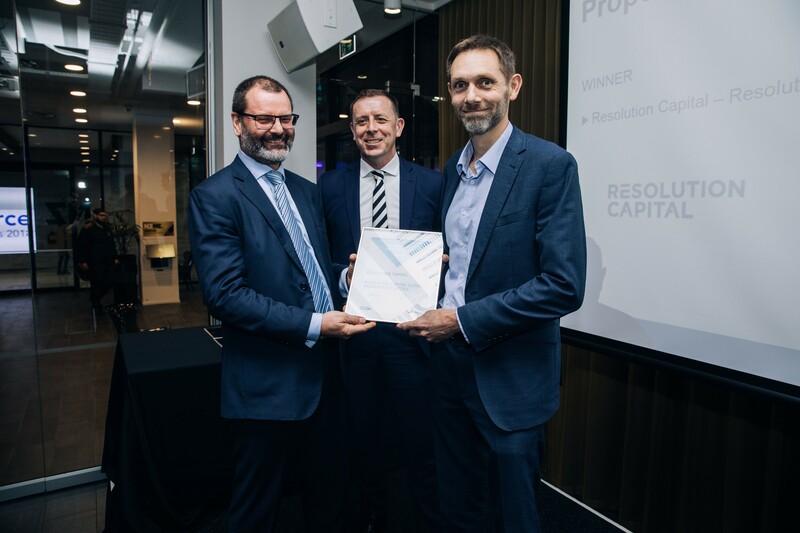 We are pleased to announce that the Resolution Capital Global Property Securities Fund – Series II (the ‘Fund’) has taken out the International Property Sector award at the 2018 FundSource Awards. The event, held in Auckland, New Zealand, on 29 August 2018, drew a strong turnout of fund managers from New Zealand and Australia. FundSource presented 14 awards in total. Funds must pass rigorous qualitative and quantitative screening as part of the selection process, before being analysed on a performance based approach. Overseas based funds needed to demonstrate a strong commitment to the New Zealand market. From Left to right: Darren Howlin (Chief Judge, FundSource), Glen van Echten (Head of FundSource), David Batty (Pinnacle). ‘Fund Manager of the Year Awards are announced by FundSource, the investment strategy and research company. These awards should not be read as a recommendation by FundSource. For further advice on the relevance of this award to your personal situation consult your authorised financial adviser, or visit www.fundsource.co.nz.’. ‘Interests in the Resolution Capital Global Property Securities Fund – Series II (‘Fund’) (ARSN 118 190 542) are issued by Pinnacle Fund Services Limited, ABN 29 082 494 362, AFSL 238371, as responsible entity of the Fund. Pinnacle Fund Services Limited is not licensed to provide financial product advice. You should consider the Product Disclosure Statement of the Fund available at https://www.rescap.com/funds/ in its entirety before making an investment decision. Resolution Capital Limited (‘Resolution Capital’) (ABN 50 108 584 167 AFSL 274491) is the investment manager of the Fund. Pinnacle Fund Services Limited and Resolution Capital believe the information contained in this communication is reliable, however its accuracy, reliability or completeness is not guaranteed. Any opinions or forecasts reflect the judgment and assumptions of Resolution Capital and its representatives on the basis of information at the date of publication and may later change without notice. The information in this communication is not intended as a securities recommendation or statement of opinion intended to influence a person or persons in making a decision in relation to investment. This communication is for general information only. It has been prepared without taking account of any person’s objectives, financial situation or needs. Any persons relying on this information should obtain professional advice before doing so. Past performance is not a reliable indicator of future performance.